ANAHEIM, Calif., June 21, 2018 — (PRNewswire) — All things Pixar are kicking off summer at the Disneyland Resort as Pixar Pier opens at Disney California Adventure Park on Saturday, June 23, 2018. Beloved Pixar stories and characters come to life in this newly reimagined land that features the thrilling Incredicoaster and Pixar Pal-A-Round attractions, imaginative neighborhoods, Pixar-inspired food, the Lamplight Lounge, plus exciting entertainment and more. Guests will experience the wonderful worlds of Pixar in incredible new ways on this seaside waterfront at the Disneyland Resort. Pixar Pier debuts during Pixar Fest, a limited-time celebration of friendship and beyond that runs through Sept. 3, 2018, throughout the Disneyland Resort. One of the highlights of Pixar Fest is the new "Together Forever—A Pixar Nighttime Spectacular" multimedia fireworks show at Disneyland Park. Guests enter Pixar Pier through a dazzling marquee that leads to four whimsical neighborhoods. 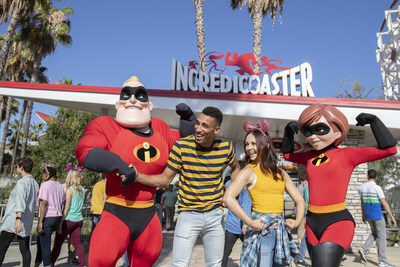 The first themed neighborhood is Incredibles Park, inspired by Disney•Pixar's "The Incredibles" and home to the Incredicoaster, the first ride-through attraction in the world to feature beloved characters from "The Incredibles" franchise. The Incredicoaster takes guests on a super adventure with the Parr family to chase after the elusive baby Jack-Jack, a storyline that will connect with fans of Disney•Pixar's latest film, "Incredibles 2," which opened in theaters June 15. New music, lighting, special effects, exciting character figures and distinctively colored vehicles add to the thrills on this super-speedy coaster, the fastest attraction at the Disneyland Resort. Adjacent to Incredibles Park is Toy Story Boardwalk, a neighborhood with the popular Toy Story Mania! attraction and its 4D carnival games. Guests can get ready to saddle up on Jessie's Critter Carousel, coming in 2019. Next to Toy Story Boardwalk is the charming seaside Pixar Promenade, which celebrates a collection of favorite Pixar stories. The iconic Mickey's Fun Wheel has been transformed to the Pixar Pal-A-Round, taking guests up high to enjoy the beautiful sights of Pixar Pier from 24 freshly-decorated gondolas – each one adorned with a Pixar pal. Pixar Promenade also features the new Games of Pixar Pier, where guests can test their skills and win a prize at colorful pay-for-play game booths: La Luna Star Catcher, Heimlich's Candy Corn Toss, WALL•E Space Race and Bullseye Stallion Stampede. Bing Bong's Sweet Stuff is scheduled to open in late summer 2018 in Pixar Promenade, offering delightful confections such as saltwater taffy and rainbow cotton candy. Just past Pixar Promenade is Inside Out Headquarters. Inspired by Joy, Sadness and the emotions of Disney•Pixar's "Inside Out," this neighborhood will feature another new family-friendly attraction, opening in 2019. Fans looking for food and beverage with a side of story will enjoy the new Lamplight Lounge, an elegant yet fun gathering place for the entire family near the entrance of Pixar Pier. Lamplight Lounge serves a new menu of California casual gastro-pub cuisine that is playfully presented, along with unique signature cocktails. The seaside lounge contains a full bar with picturesque waterfront views of Paradise Bay from both upstairs and downstairs. Lamplight Lounge celebrates the creativity, inspiration and personalities of the artists and storytellers who have brought Pixar stories to life. Guests will discover the artistic marks that Pixar "regulars" have left throughout the lounge, including concept art, a quick sketch on a coaster, memorabilia and collectible toys of beloved Pixar characters. Creative food and beverage locations extend all along Pixar Pier, with stories and menu items inspired by Pixar films. Adorable Snowman Frosted Treats, already a fan favorite, is inspired by the lovable and not-at-all-abominable monster from "Monsters, Inc." and it serves delicious soft-serve cones and parfaits. Jack-Jack Cookie Num Nums in Incredibles Park features baby Jack-Jack's favorite treat for guests to enjoy. At Toy Story Boardwalk, guests will sample the fare at Poultry Palace and Señor Buzz Churros. Poultry Palace, which looks like the fun, oversized meal box and juice box featured in the Pixar short, "Toy Story Toon: Small Fry," offers delicious turkey legs and chicken drumsticks. Señor Buzz Churros offers the quintessential Disneyland Resort treat. Further along the path at Pixar Promenade, guests discover Anger from "Inside Out" at Angry Dogs, a spot where the more Anger burns with rage, the hotter the hot dogs get. The remaining areas of the original Paradise Pier – including Paradise Gardens, Silly Symphony Swings, Jumping Jellyfish, Goofy's Sky School, Golden Zephyr and The Little Mermaid ~ Ariel's Undersea Adventure – become a new land called Paradise Gardens Park. The year 2018 marks the "Year of Pixar" at Disney Parks, where guests are celebrating two decades of Pixar stories and characters. In addition to the opening of Pixar Pier at Disney California Adventure park, Disneyland Resort is celebrating with the limited-time Pixar Fest, a celebration of friendship and beyond, through Sept. 3, 2018. Shanghai Disney Resort recently opened Disney•Pixar Toy Story Land, and Walt Disney World opens Toy Story Land at Disney's Hollywood Studios on June 30, 2018. Pixar Animation Studios, a wholly owned subsidiary of The Walt Disney Company, is an Academy Award®-winning film studio with world-renowned technical, creative and production capabilities in the art of computer animation. The Northern California studio has created some of the most successful and beloved animated films of all time, including "Toy Story," "Monsters, Inc.," "Cars," "The Incredibles," "Ratatouille," "WALL•E," "Up," "Toy Story 3," "Brave," "Inside Out," and "Coco." Its movies have won 32 Academy Awards® and have grossed more than $11 billion at the worldwide box office to date. "Incredibles 2," Pixar's 20th feature, opens in theaters on June 15, 2018.